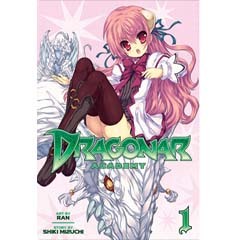 Learning to ride and tame dragons comes easy to most students at Ansarivan Dragonar Academy—except for first-year student Ash Blake, who is known by his fellow classmates as the “number one problem child.” Poor Ash is the laughing stock at school because, despite his unfashionably large star-shaped brand that marks him as a future dragon master, he has nothing to show for it. His dragon has never appeared. Until now, that is. One fateful day, Ash's dragon awakes in full glory, but appears different than any dragon ever seen before—in the form of a beautiful girl! What's worse, Ash soon discovers that this new dragon has attitude to spare, as she promptly informs him that she is the master, and he, the servant. Ash's problems with dragon riding have only just begun.